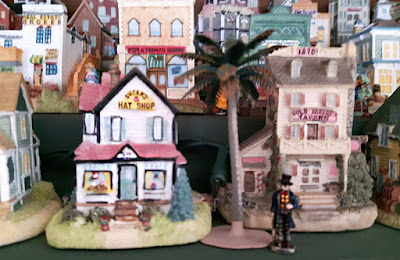 Back in November I wrote about my annual obsession with Christmas village pieces (see Excitement is Simple) and my recent efforts to add a few more pieces. 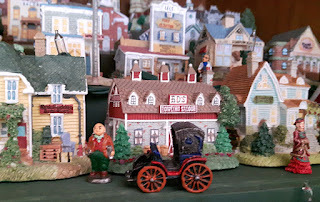 And no, this post isn't about Christmas villages again, but my newest "obsession" has grown from that interest. I had been thinking it would be nice to have a couple of pieces something like the village, but that weren't typical seasonal pieces - houses or buildings without snow or seasonal decorations on them. Actually, I do have one piece we bought at a garage sale last year in Florida and I didn't notice that there wasn't any snow or anything "Christmas-y" about the piece. I stuck it on a shelf in the guest bedroom and left it there as a "night light". I wanted was a few pieces for a shelf that was below one of my side tables in the livingroom that I could leave up year round. The shelf isn't huge since it's a side table, so I wanted something a little smaller. Well ... where else would you look besides eBay? There were lots of search results, but the ones I settled on are very small, roughly about 3" square at the base, and from 3" to 3 1/2" high. Tiny houses. 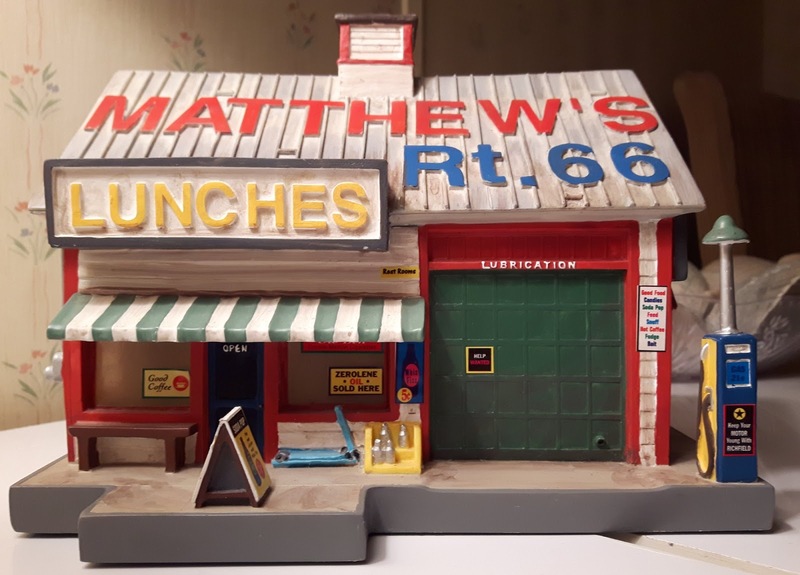 They don't light up; they are made of resin; and the last thing that made them a good choice ... there were a lot available for reasonable prices. They also had a name: Liberty Falls. I'd never heard of it before but thought the size range would allow me to put a few pieces on the shelf and call it done. I decided on a collection of 19 pieces (about $30 with shipping) and ordered that. I figured that would be it ... a one-time purchase to fill up the shelf. All I can say is ... I was wrong. When the pieces arrived (each one in their own tiny box with their own authentic paperwork) and I opened the first one ... I was hooked. I also realized that even though they were small, they wouldn't fit on the table shelf unless I just lined them up one after the other and ... the shelf was low to the ground which made them hard to see without getting on your knees. It's an obsession ... but why? I don't have a lot of knick-knacks or tchotchkes, so I asked myself why this obsession? There is something about the Liberty Falls collection that just ... tickled my fancy I guess. They are tiny, but have the most incredible detail. 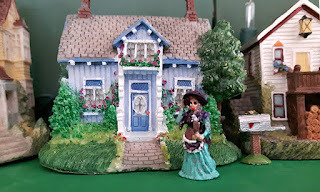 Each of the four sides of each building is complete - miniature details like windows, flower boxes on the windows, garden plants and shrubs, bricks shutters, stairs, doors, tools, signs ... even at the back of the building. Most of the larger Christmas pieces don't have that level of detail except at the front of the buildings. When I held that first one in my hand, and turned it around examining all four sides it made me smile. 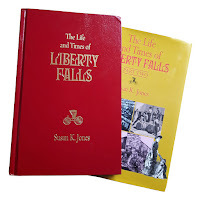 While Liberty Falls (the "place") doesn't exist, what made Liberty Falls a village does exist. Many of the buildings are modelled after real homes of people who lived in many different small in villages in Colorado. The time period falls in the mid 1800s to the early 1900s so some of the buildings and homes are Victorian, some are simply cabins. 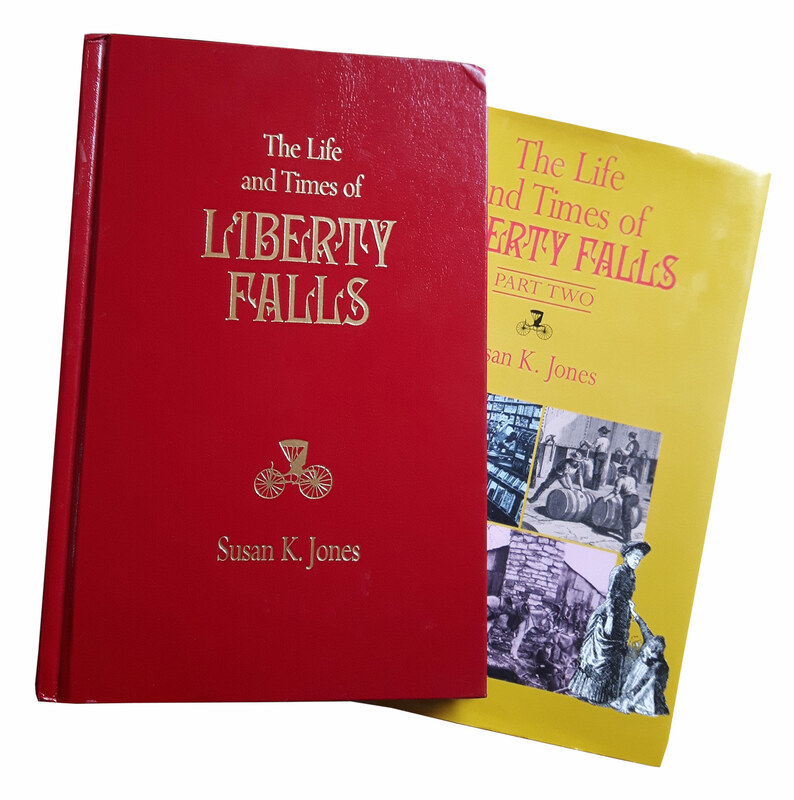 There are some historical references online for Liberty Falls as well (The Story of the Liberty Falls Collection). It seems that during it's original release it became very popular (probably only in the US which could be why I'd never heard of it). 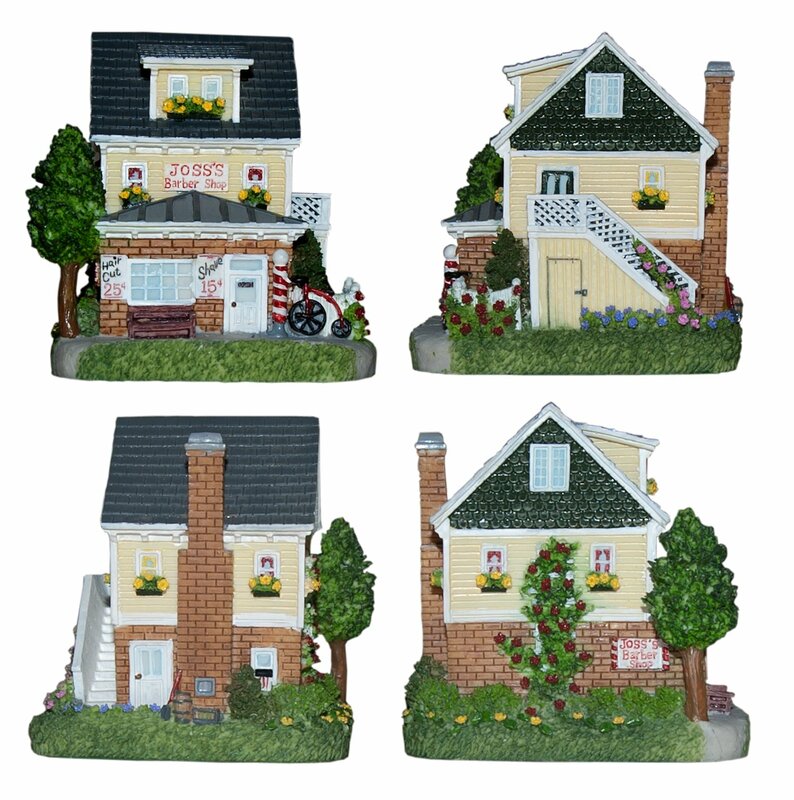 Several buildings were released each year, with special pieces that could be purchased only if you'd bought every building released during the year and had all the stickers to prove it (some of the buildings I have still have these stickers inside the box). 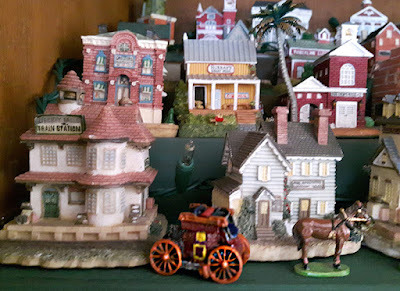 This tiny bunch of buildings comes with a fantasy all it's own and even two books that try to detail what life would have been like during this period in a small mining town in Colorado. Naturally I had to have the books (not eBay this time) but on eBay I could only find the second one. I ended up buying the pair from an online book seller. While this isn't a word I use very often, these tiny pieces have charmed and delighted me, and that hasn't worn off yet. I wonder if it ever will? Maybe not. Looking at each piece I find myself imagining life in a simpler (but sometimes harder) time. Of all the buildings in my own collection, 4 are not from the Liberty Falls collection. 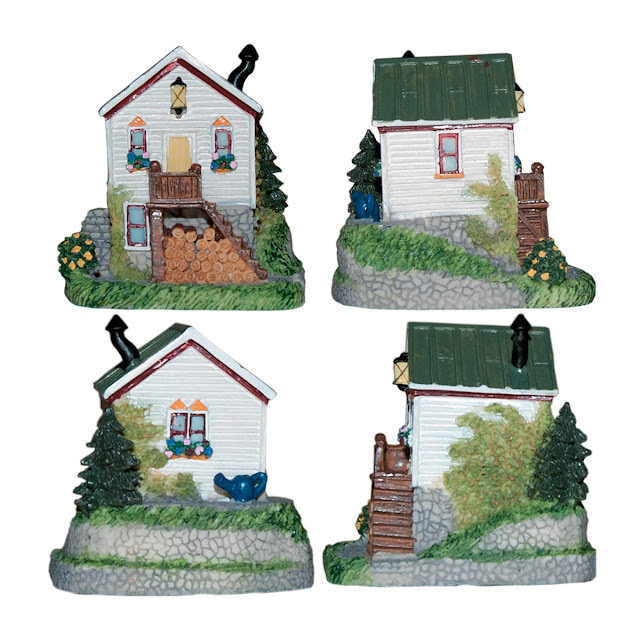 On eBay I found two other collections of a similar size - the Harmony Grove Collection, and the Crystal Falls Collection. 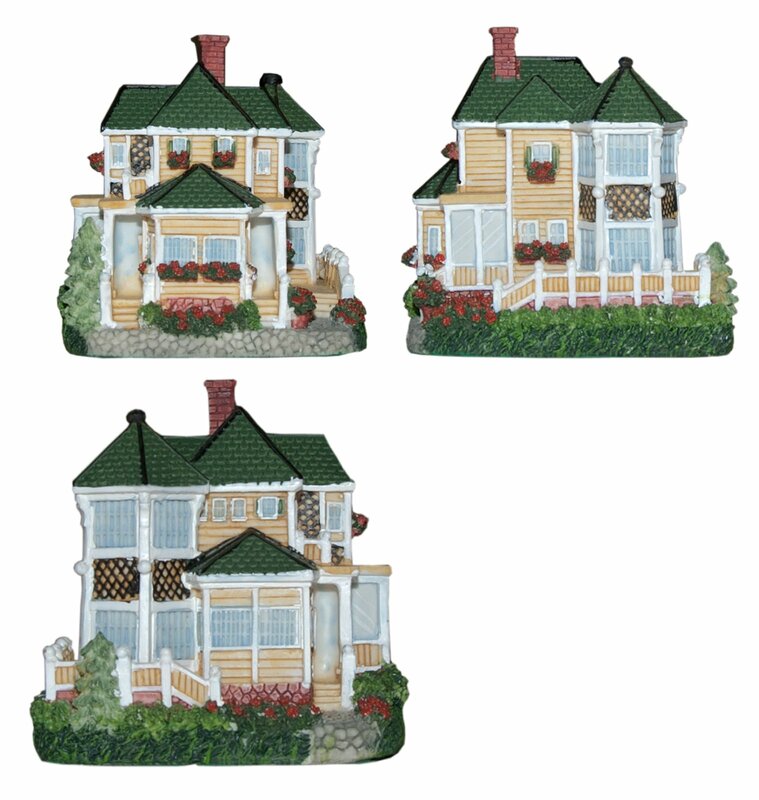 I can't find out much about the Harmony Grove Collection and there seem to be very few pieces over all, but it's size and detailing are similar. 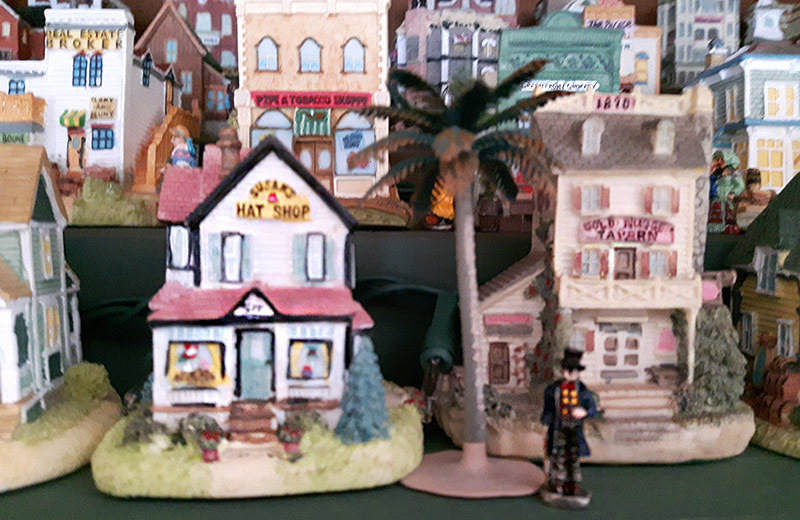 In the second last photo above, the green building right behind the Gold Nugget Tavern is titled the Green Front Grocer's, and that's one of the buildings from the Harmony Grove Collection. The Crystal Falls collection (although of a similar size and building type) is snow-covered, so I didn't have a lot of interest in those. There seem to more of them than what is available for Harmony Grove, but a lot less than what is available for Liberty Falls.